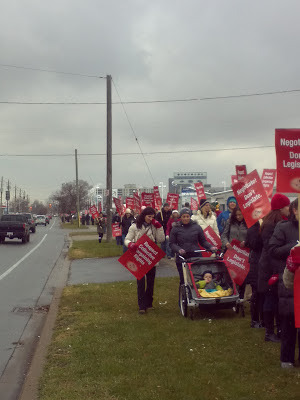 Thank you to everyone who participated in our strike action! Many hands make light work, and all the people coming together to help out really proved that! Below are some links to media coverage of the event, as well to photos available on our Facebook page. You are expected to arrive at the office of MPP Jim Bradley no later than 11:30am. It is preferable if you arrive 15 minutes earlier to park and come to the intersection of Scott and Secord Drive. You can park at Central Community Church down the street if you wish. A variety of food options are nearby. You are expected to arrive at the office of MPP Tim Hudak no later than 11:30am. It is preferable if you arrive 15 minutes earlier to park and come to the sidewalk in front of the No Frills grocery store, on King Street and Mountain Street, in Beamsville. Please do not park in the plaza. You can park at Great Lakes Christian High School down the street if you wish. A variety of food options are nearby. Report to the school where you're doing your LTO. The school steward or strike captain will record you on the school's roster. This is a legal strike and participation is mandatory. Your presence must be registered at the site for strike pay purposes. Look for those wearing the ETFO red touques and make sure that you bring picture identification. Attendance will be taken after Gary speaks. Children are welcome. You must contact your local office if you require accommodation (can't attend) and you must provide supporting documentation. Your local office will be open from 4-6 pm on tomorrow, December 10 in order for you to pick up the accommodation form. Following our shift of 3 hours we are invited to Amici’s (the old Arizona’s location), at Merrittville Hwy and Beaverdam Rd to a rally and debriefing. I would encourage all Occasional Teachers to stop by from 3 to 5 pm. We voted 96% in favour of the strike actions we are planning. Even if you are part of the 4% you are expected at the locations mentioned. If you're not on LTO, you are expected at one of the MPP offices: Schools are already well covered by their staff. We need you for the political protest portion of this strike action. We are engaging in a full withdrawal of services on Tuesday December 11th. This is a legal strike and participation is mandatory. You will picket at the school where you're working your LTO. Inform the Steward or Strike Captain (wearing red ETFO toque) to include you on their roster, and sign in with them for attendance. Contact your school steward to determine which 3 hour picket shift you'll work. We are currently waiting on permits. Once finalized, you will be notified of the sites where we'll be picketing. Report to a Strike Captain (wearing a red ETFO toque) to register your attendance. Plan to work a 3 hour picket shift starting at 11:30am. Try to arrive 15 minutes early. You must contact your local office (905-892-0270) if you require accommodation and you must provide supporting documentation. Fonthill office will be open from 4-6pm on Monday. Your presence must be registered on-site for strike pay. Strike pay is not taxable and is not counted as earnings for EI. All Occasional Teachers should plan on attending Amici’s (Merrittville Hwy & Beaverdams Rd) from 3-5pm. Food and drink will be provided. Thank you in advance for the solidarity and support during this challenging time in our history! If you have any questions, please call 289-241-7899. Online vote for political protest day. Update: Over 46,000 members voted, with 92% in favour of a political protest if needed. This vote is only to decide if ETFO will stage a one day political protest in the event that Minister Broten decrees us back to work if/when we go on strike. We've already voted to support strike action, and we are now in a legal strike position. Any strike action (work-to-rule beginning Dec 3rd, full withdrawal of services, etc) is not optional. As a member of the union, you are required to participate. ETFO has launched a new website with information about Bill 115, including a petition to be signed. Send an e-mail to contactinfo@niagaraot.org using a NON-DSBN e-mail address with your full name in the subject line and you will be automatically entered in a weekly draw for a chance to win an awesome prize! Keep track of events through the "Events and Professional Learning" options on the menu on the right-hand side of this page, and/or through the "Calendar" link, and/or sign up for e-mail updates through the "E-mail Groups" link. Fair Hiring regulation 274/12 effective immediately! We now have seniority hiring, effective immediately! Regulation 274/12, which is very similar to what we proposed to DSBN back in June, defines a fair and transparent hiring model. Read it here. This regulation is effective immediately. We expect we'll learn more over the next couple weeks about how the DSBN intends to implement this, and many questions still remain, particularly in the context of a bargaining year. There do appear to be caveats (it's not ideal from our perspective), but it nonetheless appears to be a solid step forward. We'll keep you updated as we learn more. Make sure you come out to events this year so you can hear about this! There's a BBQ at the end of the month (check out the Calendar and Professional Learning links on the right). 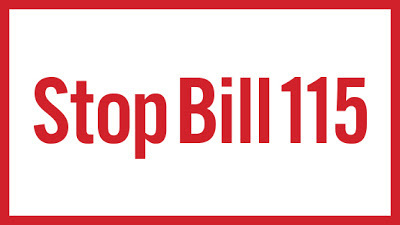 On September 11th, the Ontario Liberal government passed Bill 115: An Act to implement restraint measures in the education sector (the so-called "Putting Students First Act"). This act imposes the terms of the OECTA memorandum of understanding on the entire education sector. The bill eliminates our right to strike, allows the Minister of Education to unilaterally set the terms of our collective agreement, and among other things eliminates the ability of the Ontario Labour Relations Board and arbitrators to make rulings on whether Bill 115 is constitutional or violates the Ontario Human Rights Code. It also states that nothing under Bill 115 "shall be questioned or reviewed in any court." Clearly, this is not the type of legislation we expect to see arising in a free democratic country like Canada. ETFO has already launched a legal challenge under the Canadian Charter of Rights and Freedoms, and a variety of escalating actions will be happening this year in response. Please monitor this web site for more information, sign up for our e-mail lists, and visit controlyourfuture.ca. There will be a protest this Friday September 14th at 4:00pm outside the offices of Jim Bradley and Tim Hudak. ETFO is asking teachers to "take a pause" every Monday by refraining from providing their employers with any voluntary work, and leaving/arriving to work no longer the 30 minutes before/after the school day. For occasional teachers, our challenge will be to not allow ourselves to get stuck filling in for the activities/services our full-time colleagues are refraining from providing. Please express your outrage by sending a message to your MPP. Political Protest August 28th! Sign up for the bus! On August 27th the government is set to pass anti-collective bargaining legislation that strips us of our constitutionally protected rights and imposes so-called "agreements" on us. Particularly for occasional teachers, we need to have the ability to bargain local issues; we have too many issues that get ignored at the provincial level. On August 28th, ETFO, CUPE, and OSSTF will be holding a protest at Queen's Park from noon till 1:30pm. There will be free buses leaving from the CAW Hall at 124 Bunting Rd. at 9:00am on Tuesday. The bus will leave Queen's Park at 2:00pm to return home. Bring a lunch and something to drink. Update: Over 15,000 were in attendance yesterday. Here's an article. 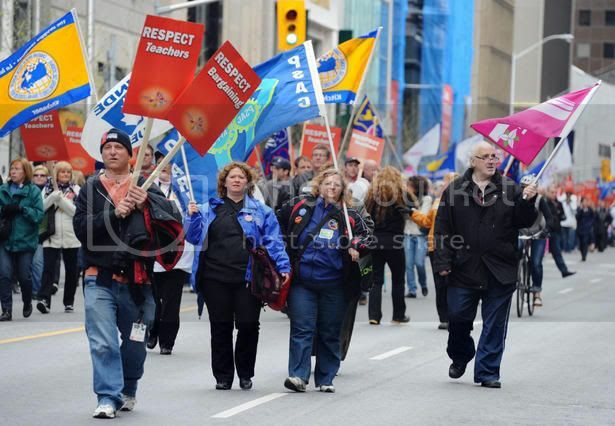 Our fearless leader was featured in this picture which was used in a Toronto Star article about the Day of Action Against Cuts protest... click on the image for more photos. There were probably close to 20,000 people there... while marching I couldn't see either the front or the end of the sea of people. Let's hope McGuinty gets the message that he needs to tax corporations, not cut public services! April 21st Day of Action Against Cuts! 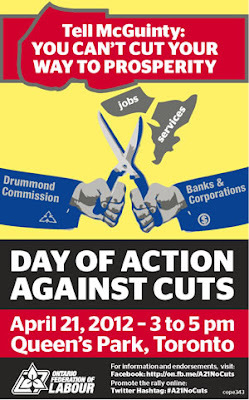 Join us on April 21st at Queen's Park to rally against government cuts! For more information contact president@niagaralabour.ca or call Daniel Peat at 905-933-1889. The Ontario College of Teachers is electing a new College Council this year. Online electronic voting will begin on March 5th, and closes on April 10th. Results will be announced April 12th. To vote, simply log into the Members Area of the College of Teachers website and you'll be presented with a ballot. There is one position you'll be able to vote for where you have the chance to elect someone to College Council who will understand and represent the issues of occasional teachers. That is the “Southcentral Region Part-time/Full-time” position. Each region has two positions: full-time only, and the part-time/full-time position (part-time in this context includes occasional teachers). The part-time/full-time regional positions are the only positions which allow occasional teachers to have direct representation on College Council. Niagara occasional teacher Mark Carter is a candidate for the Southcentral Region Part-time/Full-time position, and we encourage you to vote for him. Mark can bring to the College of Teachers a genuine understanding of the realities of being an occasional teacher. He has served on your Local Executive in many capacities for the past seven years, and we're confident that he will quite capably represent your interests at the College of Teachers. His election web site is at http://octelection.markcarter.info. Monitor collective bargaining news at the ControlYourFuture.ca website. From there you can subscribe to the provincial bargaining news eNewsletter, download the app, view videos, and learn about the collective bargaining process. For the latest bargaining news, visit ControlYourFuture.ca.